Christmas Eve storm damage: 3+ months on we're almost there! It's been a bit of a saga getting the storm damage to our roof repaired. We've had trouble communicating with the insurance company, phone calls tend to involve hanging on for 30-40 minutes and then you may get through to someone that can help or you may have lost the will to do anything constructive with your life. We had some initial success with email but then that dried up fairly quickly... The insurance company changed the contractor they'd assigned the work to part-way through too which didn't help and caused some hoohah about the £100 policy excess, but thankfully that was quickly and efficiently resolved by the new contractor. But we're pretty much there now. 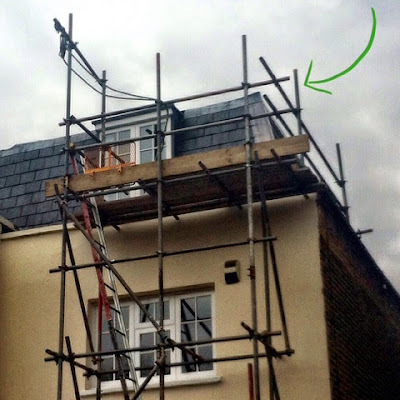 The scaffolding went up (front and back) last Wednesday but at the time we didn't know when the contractor would arrive to carry out the work. We were in luck he hoped to come the next day which worked for us - and he arrived when he said he would and the work only took a day. Amazing, all this time to-ing and fro-ing for a days work. The new fence panels went up in the middle of February but we were still waiting for the trellis. 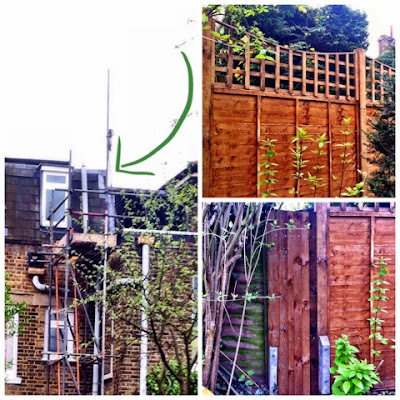 That's now arrived and was fitted in the middle of March, which just left the small panel, shown completed in the bottom right picture above. That was also done last Thursday, so finally all the repairs have been carried out. Now all we need is for them to come and retrieve their scaffolding!